Politics is a dirty game, and if you're a woman it’s even twice as rough. Women in politics tend to be held to higher standards then men; they have to be tougher without seeming to lose their femininity. They are judged not only on the issues, but how they look. While their opponents may keep on the kid gloves against them, their supporters can come out swinging. Helen Gahagan Douglas (1900-1980) found that out the hard way when she ran for the United States Senate in California against future Vice-President & President of the United States, Richard Milhous Nixon. The year was 1950, World War II had been over for five years, and Harry Truman was President, having been elected in his own right in 1948. It was the beginning of the post-war baby boom, but there was a storm cloud that was hanging over the country, and that was the threat of communism. The Soviets who had been allies during the War were now being looked at as the enemy. Senator Joe McCarthy of Wisconsin has just started his anti-communist witch-hunt, declaring that he had a list of known subversives in the US government, Klaus Fuchs had admitted to selling atomic secrets to the Russians, and the Hollywood Ten, a group of directors and screenwriters, had just been cited for contempt of congress and were facing jail time. In the US, if you wanted to be elected, you had to be anti-communist; to be otherwise was to be seen as Anti-American. This was the climate in the country when Helen Gahagan Douglas threw her hat into the ring for the US Senate. She was in the middle of serving her third term in the House of Representatives when she decided to run. If she had won, she would have been only the 4th woman elected to the Senate. Helen was getting bored with the slow pace of the House and decided it was time to run for Senator. From the beginning she faced opposition with the Democratic Party, who wanted her to wait until at least 1958 before she ran, gaining a few more years in the House under her belt. But Helen was determined, once she made up her mind to do something, it was done. In 1950, there was only one woman in the Senate who had been elected in her own right, not been appointed to serve out her husband's term, and that was Margaret Chase Smith from Maine. Helen's opponent Republican candidate Richard Nixon couldn't have been more different. She was glamorous, charismatic and effervescent while Nixon was intense, shy, with shifty eyes and a chip on his shoulder the size of Mt. Rushmore. From an upper middle class family who lived in a mansion in Park Slope, Brooklyn, Helen was a former actress and opera singer married to the actor Melvyn Douglas. Nixon came from a far more modest background in Whittier, CA; his father ran a grocery store. While Helen had dropped out of Barnard College to pursue her acting career, Nixon went to a small local college before attending Duke University Law School where he had his first brush with the criminality that would be his downfall (he orchestrated a break-in to find out his class standing which turned out to be third). While she had grown up in a Republican family, over the years she had become more progressively liberal. Helen was everything that Nixon despised, a rich liberal who was also a woman. As far as Nixon was concerned, women didn't belong in politics, they belonged in the home like his wife Pat. 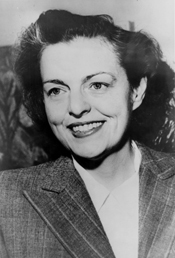 When Helen entered Congress in 1945 she was one of 9 women out of a total of 435 members. Helen made a name for herself in the House immediately scoring a seat on the Foreign Affairs Committee. She wasn't demure or winsome, following the leadership of the men. Helen was smart and beautiful and not afraid to speak her mind. Passionate about civil rights, Helen broke the color barrier, when she hired an African-American woman, the daughter of one of her constituents, as a secretary. She was against the arms race, believing that the atomic bomb shouldn't have been shared with the Soviets and other countries. Nor was she for loyalty oaths or outlawing the communist party, not popular stances in the house. Although she never co-authored or sponsored any legislation while in the House, she was considered impressive enough to be thought of as a potential Vice Presidential candidate in 1948, and many thought that she was Presidential material. During the campaign for Senate, Nixon stressed his humble roots, his pretty wife Pat and two adorable daughters Julie and Tricia, a solid middle class family. So different from Helen's life, whose husband was on tour with a play during her campaign, and her two children who were in boarding school. She was painted as an elitist East Coast liberal with a Jewish husband. Even her talent was called into question by Nixon’s supporters. Why wasn’t she a famous movie-star like her husband? For the record, Gahagan had starred in one Hollywood movie, She in 1935, playing Hash-a-Motep, queen of a lost city. The movie, based on H. Rider Haggard's novel of the same name, is perhaps best known for popularizing a phrase from the novel, "She who must be obeyed." While the film received mixed reviews, it has since become a cult classic. Finding that movie making didn’t agree with her, all that waiting around, Helen had focused more on the stage and radio. Nixon began alluding to her alleged Communist sympathies, pointing out that her husband had belonged to several groups that turned out to be Communist fronts. He hinted that she was a fellow traveler, citing as evidence her supposed Communist-leaning votes in Congress. He also made vaguely anti-Semitic comments referring to her as Mrs. Hesselberg (Melvyn Douglas’ real last name) Nixon’s campaign manager, Murray Chotiner, ran with the idea; he had flyers printed up on sheets of pink paper to emphasize the point. While Helen fought hard, Nixon kept her continually off balance, having to defend her record instead of being able to focus on the issues. She also had a problem raising money. Nixon was in the pocket of the big businesses of California, in particular the oil industry. Even Joseph and Robert Kennedy donated money to Nixon’s campaign. People she had counted on in the past such as Ronald Reagan had switched allegiances to the Republican Party. Helen wasn’t helped by the fact that the US had gone to war against Northern Korea or by the arrests of the Rosenbergs for passing secrets to the Soviets. Helen’s biggest mistake was in misjudging the very real fear that Americans had about a communist threat to the country. Nixon won the election in a landslide with 59% of the vote. Helen threw in the towel on her political career. It would take more than forty years before California elected a woman to the Senate, and as if to make up for lost time, they sent two. After it was over, Helen tried to analyze what had gone wrong, before putting the whole thing in the past. She kept active, protesting against the Vietnam War (a stance which ended her friendship with Lyndon Johnson), and against the nuclear arms race. When Watergate went down in 1973, a popular bumper sticker in California at the time, read “Don’t Blame Me, I voted for Helen Gahagan Douglas. She died in 1980 at the age of 79 from breast and lung cancer. Thanks for this--a wonderful, powerful, American woman who I now want to learn even more about (and a woman I had never heard of until this post). Thanks Linda! I'm not even sure how I heard about Helen. I might have seen a book in the library but once I started reading I was fascinated. Her story is so modern, and things haven't changed that much since the 1950's. There are still not enough women in either House. "Scandalous Women" has been included in this weeks Sites To See. I hope you like the image I featured, and I hope this helps to attract many new visitors here.